From the creator of the mentos soda geyser–the viral video sensation–comes a collection of outrageously entertaining science experiments and cool tricks guaranteed to get ooohs and ahhhs! Author, celebrity teacher and science guy Steve Spangler teaches you how to transform the ordinary into the amazing as you make everyday items ooze, bubble, fizz, and pop! Make people wonder . . . How did you do that? This is not your ordinary book of science experiments. 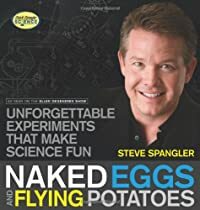 Naked Eggs and Flying Potatoes is a geek-chic look at Spangler’s latest collection of tricks and try-it-at-home activities that reveal the secrets of science in unexpected ways. Over 200 color photographs accompany the step-by-step instructions, and simple explanations uncover the how-to and why for each activity. Make potatoes fly, bowling balls float, and soda explode on command. But don’t try these experiments at home . . . try them at a friend’s home!